Keep your business smelling fresh with Noble Chemical’s Country Breeze aerosol air freshener and deodorizer. In order to provide guests in your hotel or restaurant with the best experience, it’s important that your business is smelling fresh and clean. 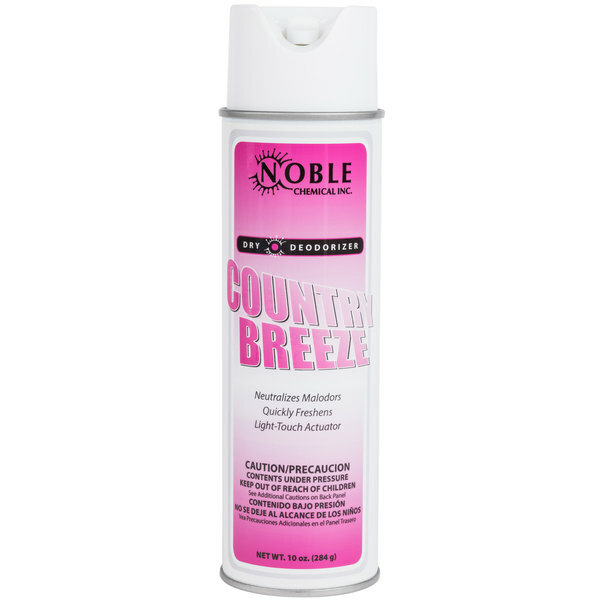 With Noble Chemical’s Country Breeze aerosol freshener and deodorizer, you can do just that. This product is perfect for eliminating malodors caused by smoke, organic decay, urine, and vomit. Country Breeze has a unique dual odor counteractant system that is capable of masking odors in all settings, including restrooms, board rooms, conference centers, and office spaces. 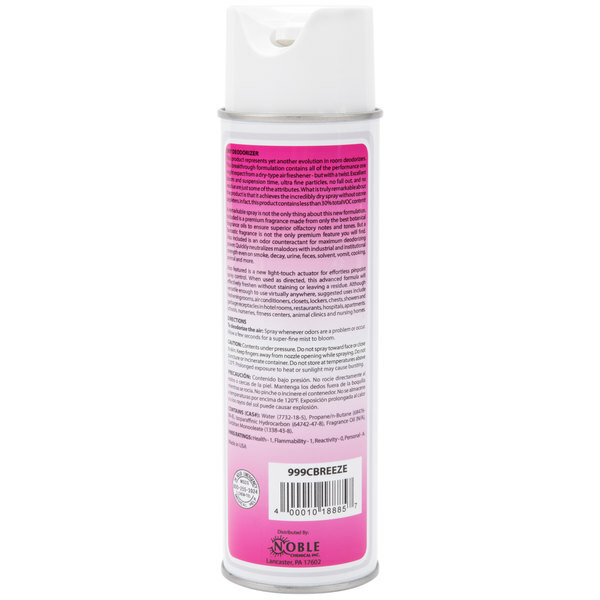 Additionally, this deodorizer has an ultra-fine spray design that evenly spreads to treat large areas in seconds without leaving any residue behind. "Country breeze brings the smell of the country side to any hotel room or living area! Great scent and the can lasts a long time!" To use this product, follow the instructions printed on the label. Simply spray whenever odors are a problem. Allow a few seconds for a super fine mist to bloom. Refresh features a fresh scent that will neutralize offensive odors in your foodservice establishment, hotel, or healthcare facility. However, the scent is light enough that it will not overwhelm your staff. Noble Chemical brand supplies are a smart addition to any restaurant, hotel, or healthcare facility, and this handy deodorizer will keep your business smelling fresh. Noble Chemicals offers an extensive selection of institutional and industrial supplies, including cleaning chemicals, insect control solutions, disinfectants, and other products, all of which are available at competitive prices. Plus, these chemicals come packaged in simple jugs and containers that are versatile enough for nearly any job in a business. The country breeze spray smells amazing. The scent lasts longer than most deodorizer. It is a good price for the spray. I would definitely recommend! I purchased both the Vanilla scent and Country Breeze. As far as the vanilla goes, it is true to the scent and liked by most of my clients. The Country Breeze however, has a very strong Berry Scent, I did not know what country scent would be, but it's similar to cranberries. The scent is a bit offensive, and my clients do not care of it at all. No fault with the product itself, just the scents. I wish it came in Linen Breeze, as that is by far the most requested scent by my clients. A nicely priced air freshener that is very soothing and great smelling. The Country Breeze is perfect for any room and quickly neutralizes the bad smelling odors. A great find. 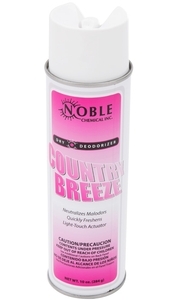 This country breeze aerosol air freshener leaves behind a refreshing scent that is not too over powering no matter where we use it. I love it. This air freshener smells great and last longer than the old freshener we were purchasing. 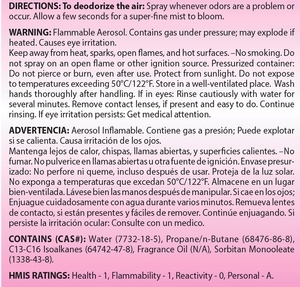 It seems to have a good deodorizer in it and seems to clean the air vs cover the smell. 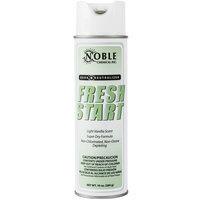 Noble chemical 10oz country breeze aerosol air freshener/deodorizer. It comes in a can clearly labeled for easy and quick detection. Just grab the can and spray an area for a refreshing smell you can enjoy rather than dealing with those bad smells! This Noble Chemical product is a dry spray meaning it doesn't leave residue behind as it falls and fills the air. Smells wonderful and masks "musky" smells well. Highly recommend as a daily deodorizer. This air freshener does the job! The scent country breeze smells great. The freshener keeps the air fresh for about 25 minutes! That's with one spray. We REALLY LOVE the smell of this one. Another one that has a decent lasting aroma. Would recommend it and will buy again when we run out. Our company uses this air freshener in our restrooms. It has a pleasant, light and airy, fragrance and makes the restrooms smell clean. We are a small business, employing ten people, so the restrooms are used frequently. I wasn't sure whether or not I would like this fragrance, but I thought I would take a chance and get a whole case while it was on sale. I'm glad I did. This stuff is wonderful. If you aren't sure, you might try one can, but it is so good, you will probably come back for more. These air fresheners are a must for any food services establishment. We use these to clear the air in our bathrooms to allow our customers to enjoy every part of their night with us. I purchase this air fresher to use in my library. The smell was very light and refreshing not overwhelming at all. The cost was very reasonable. The main concerns with air fresheners are on how long they last. this item does a great job masking the smell, as well as lasting a long time before the need to replace. The 10 oz. 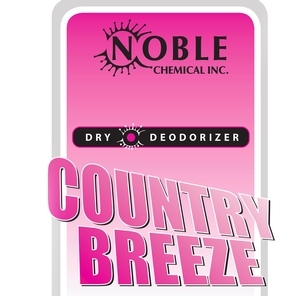 Noble Chemical Country Breeze Aerosol Air Freshener / Deoderizer sold 12 per case. It is great in masking odors. You sure can't beat the price. Country breeze brings the smell of the country side to any hotel room or living area! Great scent and the can lasts a long time!